Great trip overall. Quentin, our guide, also a man of few words, but he worked diligently to find us game and he was successful. We even saw Cheetah which are normally not easy to spot. 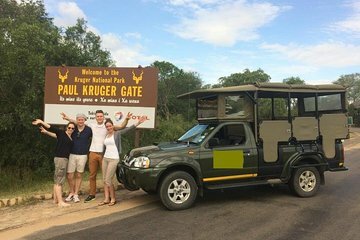 Since it was a full day tour, there are some periods of non-activity and it would be nice if he shared some general information about Kruger, the bird and plant life that abound there. I know that everyone is eager to see the BIg 5, as were we, but there are many other fascinating animals and features of this incredible park, and it would enhance the experience to hear a little bit about them from someone as experienced as our guide. This is a very small issue and I only offer it for the company's consideration as it would take an already incredible experience over the top! You will not be disappointed with this company! What a find. Arno was a man of few words but boy could he find animals. We saw the Big 5 in 2.5 hours, starting with a leopard. I cannot recommend this safari company highly enough.